Use Flower Servant and it will remind you when to water, mist, fertilize or repot Acer palmatum diskoyio. Click here and try for free! This maple is native to China and Japan. Its botanical name comes from its leaves, which have 5 or more deep lobes and vaguely resemble a human hand. It is a popular bonsai subject in Japan. The bark on young branches and trunks is usually green (may be red on some varieties) and turns brown or light gray with age. There are many different varieties of A. palmatum, including thread-leaf or lace-leaf varieties and both green and red varieties. 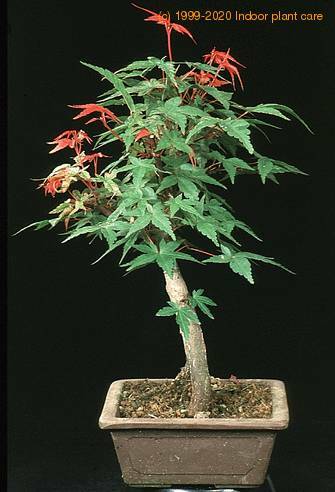 The red varieties seem to be more popular as bonsai. Japanese maples are deciduous and loose their leaves in winter. Only to return in spring providing a show of new buds that is astoundingly beautiful. Pests and diseases: Aphids, mildew, root rot.